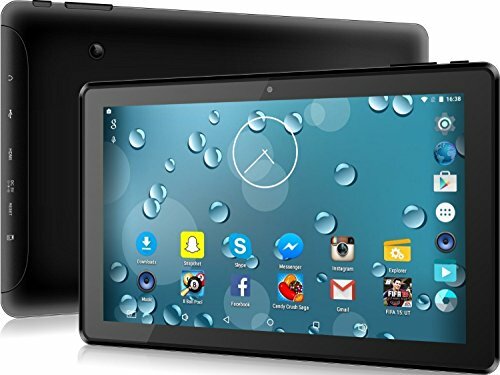 10.1” inch Tablet PC, Quad Core Android 5.1 - 1GB RAM + 16GB Memory, 64GB External Storage - HDMI, GPS, WiFi, Bluetooth 4.0 - HD 1024x600 - Sky Go, Netflix Compatible! 2017 Upgraded Model! Watch all your favourite shows on SkyGo, Netflix, iPlayer, BT Sports, Amazon Video +more to create the perfect entertainment system. Plus enjoy movies & games on a LCD, better than HD Screen & connect to your TV with the HDMI Port. Time2® - Excellent Value, Sleek Design, Unique User Experience. Time2® is an Award Winning - Established Amazon Seller - Registered U.K. & Amazon Brand. A powerful lightweight Quad Core Tablet, MTK 1.3GHz Processor & 10 inch LCD Multi-touch capacitive Screen for wider viewing angles & higher quality colour reproduction to make viewing a breeze & immersive! Download your favourite apps from Google PlayStore. With Bluetooth 4.0 connect your tablet to your favourite speaker or keyboard and make everyday tasks fun with your 10 inch tablet. With GPS supported, use your tablet on the go as a Sat Nav, browse the internet or make voice/ video calls with a Hi-Fi Speaker & Mic.